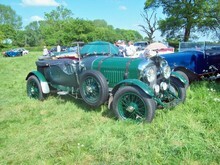 The 3 Litre was the sports car that put Bentley on the automotive map. It was a large car compared to the tiny, lightweight Bugattis then dominating racing, but its innovative technology and strength made up for its weight. The 4000 lb (1800 kg) car won the 24 Hours of Le Mans in 1924, with drivers John Duff and Frank Clement, and again in 1927, this time in Super Sports form, with drivers S. C. H. "Sammy" Davis and Dudley Benjafield. Its weight, size, and speed prompted Ettore Bugatti to call it "the fastest lorry in the world." 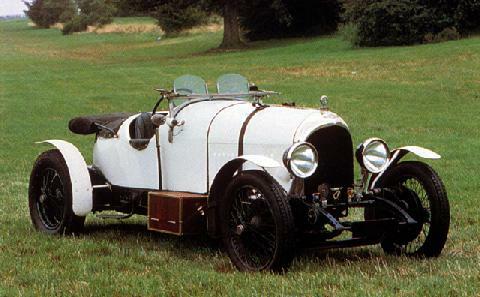 The 3 Litre was delivered as a running chassis, with Bentley referring many customers to Vanden Plas for standard bodies. Most were open touring cars, but some variety was inevitable with custom coachwork. Customers included Prince George, Duke of Kent, Gertrude Lawrence, and Beatrice Lilliewere. The 3.0 L (2996 cc/182 in³) straight-4 engine was large for its day, but it was its technical innovations that were most noticed. It was one of the first production engines with 4 valves per cylinder, and these were driven by an overhead camshaft. It was also among the first with two spark plugs per cylinder, pent-roof combustion chambers, and twin carburetors. It was extremely undersquare, optimized for low-end torque, with a bore of 80 mm (3.1 in) and a stroke of 149 mm (5.9 in). To increase durability, the iron engine block and cylinder head were cast as a single unit. Power output was roughly 70 hp (52 kW), allowing the 3 Litre to hit 80 mph (129 km/h). The Speed Model could reach 90 mph (145 km/h), while the Super Sports passed 100 mph (161 km/h). A four speed gearbox was fitted. On the early cars the brakes only operated on the rear wheels but from 1924 four wheel brakes were used.